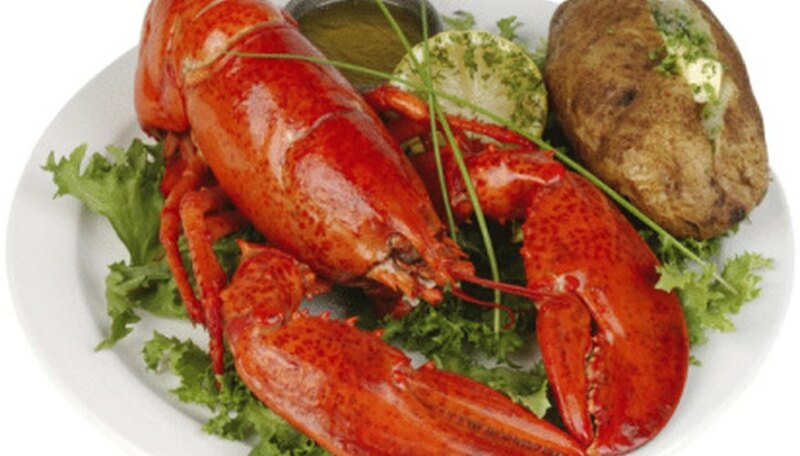 No matter where you're dining -- whether it's in a casual backyard cook-out or upscale seafood restaurant -- eating lobster is a messy process. When serving lobster, hosts should always include a lobster bib that guests can wear to stay clean. While you can buy lobster bibs from the store, add some extra flair to the dining experience by making your lobster bibs at home. Select a piece of 24-inch paper to create the pattern for the bib. Fold it in half horizontally, then fold that piece in half vertically. Sketch a curve on the paper around its folded edges. This shape should be about 10.5 inches high and 8.5 inches across. Cut out the shape. Unfold the paper lengthwise, so that it's still folded in half with a vertical line down the center. On the folded side, draw a half-circle that will become the head opening of the bib. This shape should be 8 inches long and 5 inches across, and be placed about 2 inches down from the top of the bib. Cut it out. Open the paper to reveal the lobster bib pattern. It should include a hole that the wearer can slip over his head, as well as a long piece of material in the front to cover clothing. Trace the bib pattern on any material you want to create the bib from. Use a piece of white cotton fabric to make a reusable bib, or trace the design on a piece of paper or plastic for throw-away bibs. Cut out the material along the pattern outline. Decorate the bib to match the lobster feast. Use a permanent marker to draw your own lobster on the front of the bib. Buy rubber stamps in shapes from the sea, including sea shells, to stamp across the design. Sew or glue red ribbon around the perimeter of the bib for added flair.